4 Paws Keep Off Repellent is an effective spray repellent that works on both inside and outside areas. Indoors, this easy-to-use spray can prevent your cats or dogs from destroying your furniture and carpet, from tearing up your blinds, or from accessing areas of your house you wish to remain pet-free. Outdoors, use 4 Paws Keep Off Repellent to ensure the continued health of your shrubs, trees, flowers, or vegetable plants. 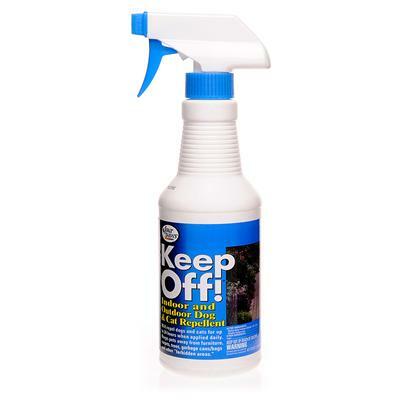 This spray is also a great product for protecting your pets from potentially harmful plants. Whatever your unique case might be, this repellent will work for you! You can expect 4 Paws Keep Off Repellent to be effective at keeping your cats and dogs away for 12 to 24 hours when applied to the affected area on a daily basis. Methyl nonyl keytone 1.9%, related compounds .1%. Directions: For outdoor situations, use training whenever possible, including positive and negative reinforcement. This product repels dogs and cats for up to 24 hours when applied daily.